Tags: Chiffon, Deep Red, Semi Formal, Shirt, Straight Trouser. Top: Red crinkle chiffon shirt has been embellished with embroidery on stand collar neckline with deep V front. 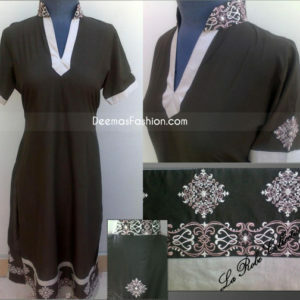 Simple and decent embroidery on collar and neckline. Embellishment work includes tila, beads, sequins, thread and stone work. Full sleeves with same embroidery on bottom as on shirt. Fully lined. Concealed zip closure on back. Dupatta: Red crinkle chiffon dupatta with heavy spry of sequence.